Gov. Roy Cooper released his proposed state budget this morning. So far, the Republican response has been a bit muted. There’s a lot to digest. 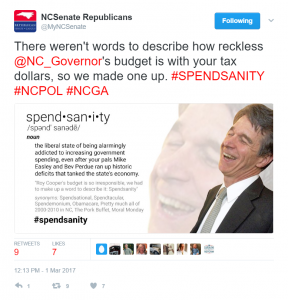 This meme has been circulated by the N.C. Senate Republicans on social media, though – and is being retweeted and re-posted by GOP lawmakers including Senate President Pro Tempore Phil Berger (R-Rockingham). Not exactly nuanced criticism…but there you are. Have a look at what the N.C. Budget and Tax Center has to say about the budget here, have a look at what it may mean for education here and get an overview from N.C. Policy Watch’s Lisa Sorg here.